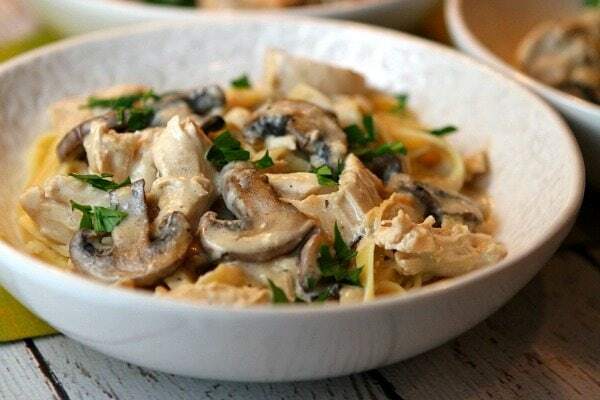 Here’s a delicious and easy pasta recipe: Chicken Mushroom Fettuccine. Click below to watch a short video showing you how to make this recipe, then scroll to the bottom of this post to print out the complete recipe. 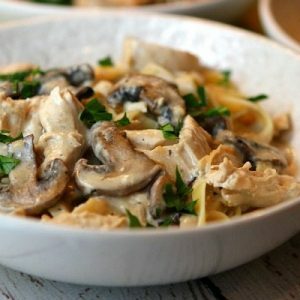 This is a comforting pasta dish full of hot fettuccine noodles that have been tossed in a light cream sauce with oodles of sauteed mushrooms and chicken. My husband and I happily gobbled up every bite of this dinner. My 13-year old is still refusing to eat mushrooms. I’m thankful that he’s beginning to eat tomatoes… and that he’s fairly willing to try most other vegetables, but I just can’t get him to eat those darn mushrooms. Oh well, more for me! I keep telling him that someday he will LOVE mushrooms. He does not believe me- ha! 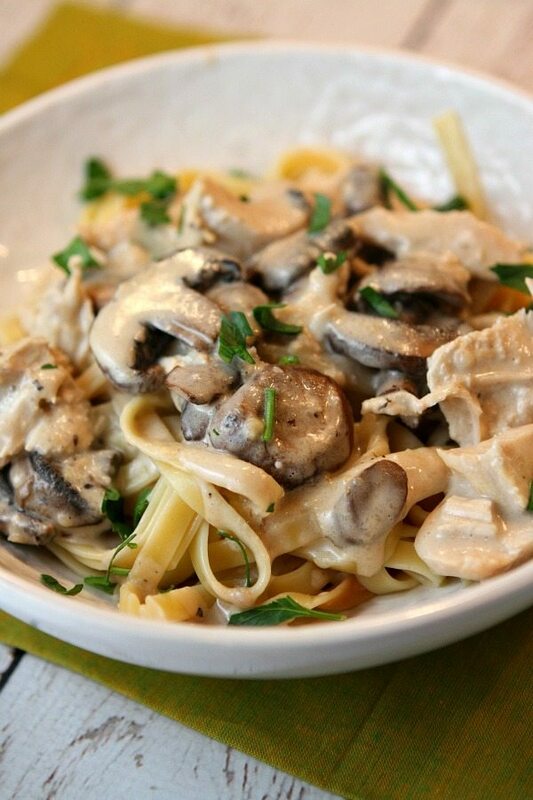 If you’re a mushroom lover, then this Chicken Mushroom Fettuccine dish is for you. And if you’re not a mushroom lover, you can certainly push them aside or leave them out. Heat oil in skillet. Add chicken and cook 3 minutes on each side, or until tender and cooked through. Remove chicken from pan, let it rest for a couple of minutes, then slice into small strips and set aside. Add the mushrooms and garlic to the skillet; cook for 1 minute, stirring. Sprinkle with flour, stirring quickly. Stir in the broth and milk. Reduce heat and simmer 3 minutes, until mixture thickens- stirring occasionally. 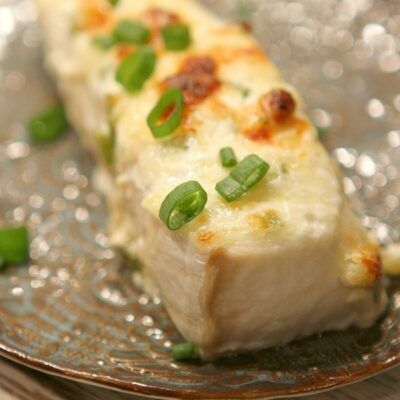 Stir in cheeses and pepper. Return the chicken to the skillet; cook, stirring for about 2 minutes, until chicken warms up. Arrange fettuccine on four plates. Top with chicken and sauce. Garnish with parsley. Awesome!!! I turned it into a quick casserole for a meeting!!! I made this tonight.. wish i could post a picture.. it came out delish.. I also made homemade garlic parsley fettuccine noodles to go with it.. My husband who does not like mushrooms ate it. I doubled the cream recipie as well.. This was wonderful and I had all the ingredients without having to go to the store. My husband said I could make this again!! And that is a compliment! Absolutely delicious!! Loved the beautiful blend of flavours. Great job on this creation! This looks freaking amazing! Can’t wait to try it out. 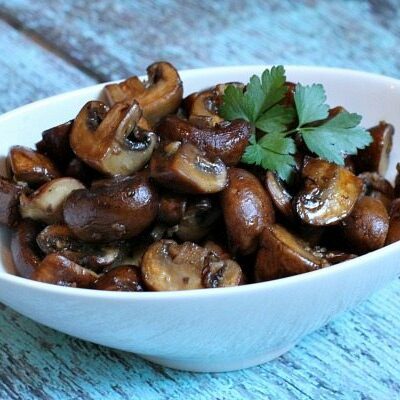 Mushrooms are the bomb – yummo! 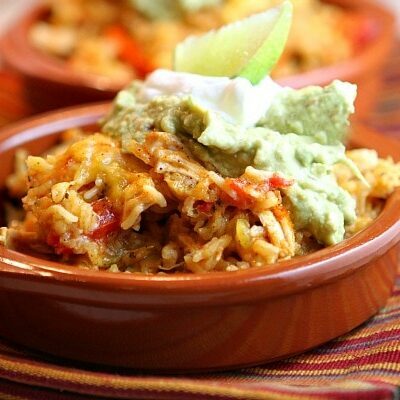 This looks so comforting and delicious! I am a big fan of mushrooms so this creamy mushroom fettuccine sounds perfect! This is a meal right up my alley. 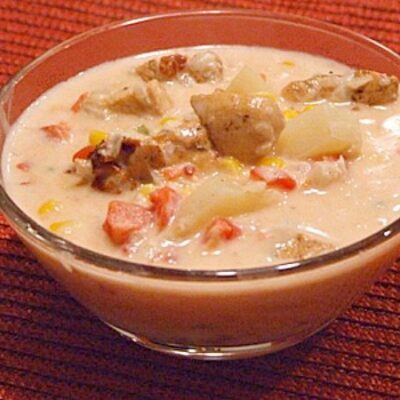 The more mushrooms the better, and the light cream sauce sounds fantastic! Pinned. We love pasta! This looks delicious!! I’ll take his share. LOVE this! I just got a pasta attachment for my KitchenAid and have been searching for a perfect fettuccine recipe. I think I just found it! Dang, that looks awesome. We all love mushrooms. Going into town today so I’ll be getting what I need to make this. There is oodles of goodness in these noodles (had to!) I recently learned that I actually LOVE mushrooms, so this dinner is totally what I am dreaming about going face-first into tonight! Pinned! If I had to pick a dream pasta, it would be a creamy one full of mushrooms just like this. Your son is missing out! (My kids won’t eat them either.) Looks amazing!